Workshop participants, from left to right: Pradeep Ashok, John Macpherson, Stian Myhre, Liv A. Carlsen, Søren Kragholm, Arnt Aske, Jan Einar Gravdal, Fionn Iversen, Chunming Rong, Jan Erik Ødegård, Marit Dolmen and Robert Ewald. Several project concepts are now being developed within the NorTex Data Science Cluster and hopefully some of these will mature into funding proposals. During the ONS trade fair in Stavanger, the NorTex Data Science Cluster arranged a Get-Together involving a morning seminar followed by a joint workshop. 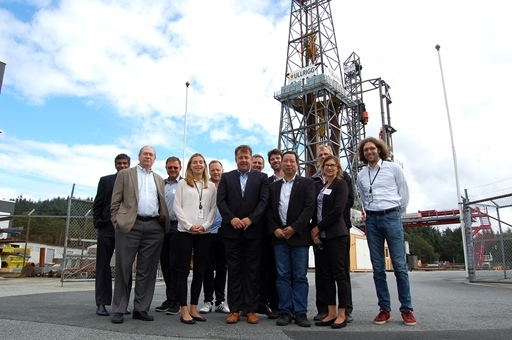 Participants from the cluster and affiliated partners in Norway and Texas met to present and discuss project concepts linked to sensors and instrumentation, data storage and communication, as well as data processing and applications. The get-together started with a breakfast seminar at the ONS on Wednesday 31 August involving representatives from IRIS, the Universities of Agder and Stavanger, the University of Texas at Austin, Global Center of Expertise (GCE NODE), Rice University and others. The speakers were John Macpherson from Baker Hughes and DSATS, and Professor Iain Sutherland from Noroff University College, who discussed data integration and information security, respectively. On the following day the gathering continued at IRIS’ offices with a workshop that included presentations and concept proposals. Project concept presentations were given by Research Scientist Pradeep Ashok from the University of Texas at Austin, Industry Consultant Arnt Aske from GCE NODE, and Chief Scientist Eric Cayeux from IRIS. The presentations covered data access, drilling problem identification using machine learning, and challenges in data communication. After the presentations, all participants selected one concept in which they wished to participate in developing. The concepts were then discussed in groups. “We arrived at three project concepts that we intend to follow up and develop further”, says Project Manager Fionn Iversen. The next step is to prepare and submit proposals for research funding. “At least one of the concepts will involve a project proposal to be submitted to the Research Council of Norway. The other two are linked to applications being made by Norwegian Oil and Gas”, says Iversen, who is very optimistic about further work on these concepts. The NorTex ONS 2016 Get-Together was organised by IRIS and GCE NODE as a continuation of discussions launched during the OTC trade fair in Houston in May. The next gathering is planned for Spring 2017. The NorTex Data Science Cluster is funded via INTPART, and brings together researchers from Norway and Texas.